Photo: Philippine Air Force (PAF). Hijab troopers salute as they ready to fly from Manila to Mindanao to assist the local Maranao affected by the Battle of Marawi. Within the last week a force of 100 military and police personel have been deployed to Marawi city. 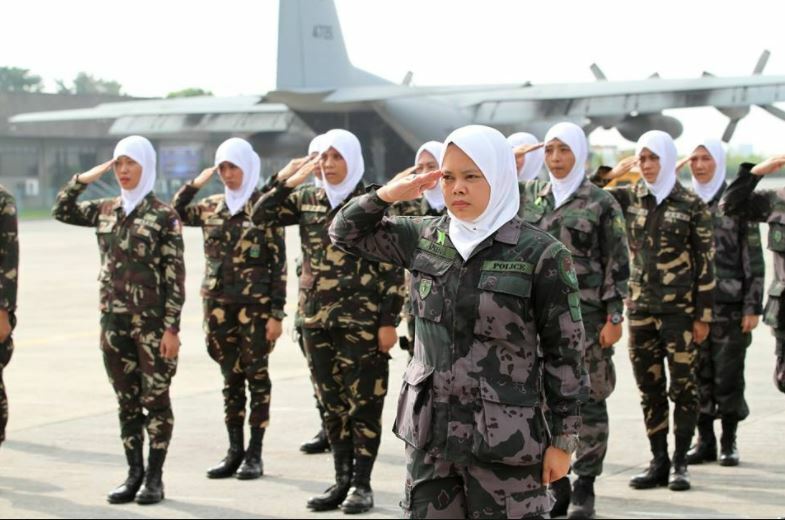 This all female hijab wearing contingent of troops will help with the ongoing rehabilitation and reconstruction efforts in Marawi City and the surrounding Maranao area. 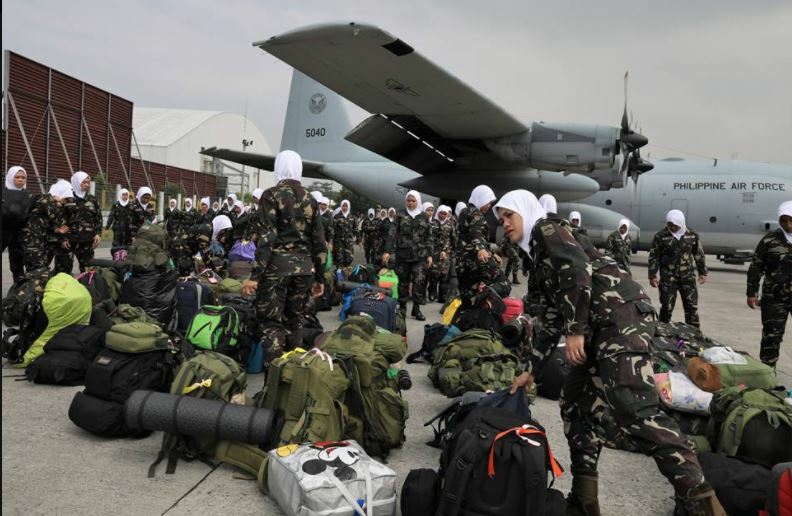 A quarter of these troops are of Maranao ethnic origin. 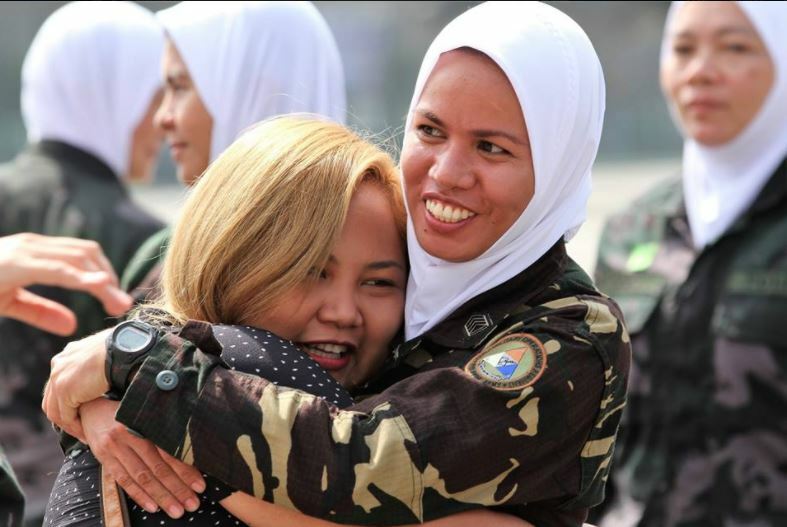 Armed Forces of the Philippines (AFP) Public Affairs Chief Marine Colonel Edgard Arevalo said that the female troops will be “facilitating psychosocial healing and peace-building". ​The troops have already helped the children and families within Marawi City by playing games with them and singing songs.The deployment of this contingent of hijab soldiers demonstrates the Philippine military's goodwill and cultural sensitivity towards the Maranao people. Efforts such as this can help gain the trust and respect of the Maranao people, as well as boost their morale as they enter into a reconstruction phase. Photo above: 3D Google Earth Map of Marawi city. Photo below: Man-made destruction in the city centre of Marawi after fierce fighting. Photo above: Philippine battle troops deploying in Marawi city. Photo below: Philippine special forces patroling Lake Lanao with Marawi city in the background. Lake Lanao has been the scene of some amphibious battles as terrorists tried to use the lake for resupply and escape.